Can Aaron Rodgers stay in Superman mode against the Giants? We already wrapped up all the loose ends from the regular season at the top of our AFC Preview, so check that out if you want all that good stuff. Here in the NFC Preview, we'll just get straight to the action. If Detroit wants any hope of being competitive in this game, they need to make plays in the passing game. That sounds so obvious that it borders on being stupid, but Golden Tate presents them a unique opportunity against the Seahawks that most teams don't have. Tate spent his first four seasons with Seattle, so he knows their secondary better than most opponents do. On top of that, he doesn't quite fall into the Richard Sherman torture chamber because he moves around so much and lines up in so many different locations. The appeal of Richard Sherman is that he can shut down an entire side of the field. Against teams with premier outside receivers, he's an invaluable asset. However, he has struggled in the past with defending receivers in the slot that have two-way option routes, and that assignment often gets handed off to a different defensive back. One of the under-the-radar stories of this NFL season is that this Seattle secondary is not the Seattle secondary of yore. Yes, their defense is still good, but Football Outsiders ranked them just 13th in the league at defending the pass, below teams like Carolina, Pittsburgh, and San Diego, who don't really have the same reputation. With Earl Thomas out and DeShawn Shead and Jeremy Lane a step below other cornerbacks Seattle has had in the past (Brandon Browner, Byron Maxwell, etc. ), the Seahakws are (marginally) exposed in the secondary, and actually ranked 30th in the league against No. 2 wide receivers, according to Football Outsiders. Golden Tate is the primary target in the Detroit passing game, but lining him up in the slot and giving him a lot of drag routes and quick outs into the flat could put a lot of uncomfortable pressure on the Seattle defense. Detroit's ground game is really, really bad, and Seattle's run defense is really, really good. That might actually work to Detroit's advantage - why bother even trying to run the ball if you know you can't? Just focus on the things you're good at. If Golden Tate comes up with a monster game, Detroit has a chance. If he doesn't, they probably don't. The Seahakws are one of the most creative teams in the league with regards to designed plays on offense and special teams. Pete Carroll always seems to be pulling different bells and whistles out of his bag of tricks. Earlier this year, they ran a wide receiver reverse throwback, where Doug Baldwin took an end-around and ended up throwing it back to Russell Wilson for a touchdown. They also tried a similar play where Wilson lined up at wide receiver, took a reverse, and then threw deep (this one didn't work because Doug Baldwin, the intended receiver, fell down). If you just type "Seahakws" and "trick play" into Google or YouTube, you'll end up with a dozen or so different times when the Seahawks tried something wacky and it worked out. They even ramp it up in the playoffs. Famously, they got themselves back into the 2014 NFC Championship game with a fake field goal when they were down 16-0 in the third quarter. Last year, they faked a punt from their own 23-yard line, down 31-14 late in the third quarter. The question for this game is whether or not the Seahawks will dig into their bag of tricks. On one hand, they might not need to, considering they're more than a touchdown favorite and they could find themselves ahead for most of the game. On the other hand, the Seahawks have had that pesky habit of either (a) sucking on offense (b) letting over-matched teams hang around for inexplicably long times, or (c) both. They managed just three points in a loss to the Rams, just five in a loss to Tampa Bay, and just 10 in a loss to Green Bay. They couldn't put away the Dolphins in Week 1 (they won 12-10 and might have lost if Kenny Stills doesn't drop a wide-open touchdown late in the game) and only won by two against San Francisco, of all teams, in Week 17. If that's the team that shows up, Detroit could give them a run for their money, and the Seahawks might need to go digging in their toolbox. Seattle is always a trendy pick to make a run in the postseason, and with good reason. Since 2013, the Seahawks have won a pair of NFC titles and a Super Bowl, but this year's team may not be quite as equipped as past groups. First and foremost, the offense has been remarkably inconsistent, with a patchwork offensive line, no Marshawn Lynch and an up-and-down Russell Wilson. The loss of speedster Tyler Lockett also won't help an offense that tends to be at its best getting the ball out quickly. In all, the Seahawks have been held to 12 points or less five times this season, but have scored 30 points or more five times. Yeah, it's been pretty boom or bust on the offensive side of the ball. Luckily, Seattle is still excellent on defense, though it could be a bit more susceptible to the pass than it has been. The Seahawks still have the league's 3rd-ranked scoring defense and 5th-ranked total D, but head into the playoffs without all-world safety Earl Thomas. Furthermore, Seattle's patented Cover 3 shell has been cracked a bit this year, causing the Seahawks to go a bit more man-to-man than they like. To compensate for that, the defense has gotten outstanding play from linebacker Bobby Wagner (168 tackles), along with defensive ends Cliff Avril (11.5 sacks) and Frank Clark (10 sacks). Basically, Seattle is still very good, but they're not very good in the same way they have been. Rather than running the ball down your throat on offense and blanketing you with their secondary on defense, the Seahawks are now getting by with a hot-and-cold pass offense and dominating front seven on defense. Detroit is a bit of an anomaly, because the Lions don't do any one thing particularly well. Detroit ranks outside the Top-10 in scoring offense and scoring defense, and actually ranked outside the Top-20 in total offense, and 18th in total defense. Their pass offense (11th in the league with 3,975 yards) is fine, and at times explosive, but their decimated running game is abysmal (30th in the league at just over 1,300 yards). It's hard to find any one area to really get pumped about when discussing the Lions, especially considering they're heading into this game as losers of three straight, essentially giving the division away to the hated Packers. Add in the murky injury status of star defensive end Ziggy Ansah and complimentary receiver Marvin Jones, and things get even uglier. But, if there is a reason for optimism, it's that Matthew Stafford and Golden Tate have formed quite a connection, while young tight end Eric Ebron seems to finally be coming into his own. The Lions have also been more consistent offensively than Seattle, but most of the numbers, and trends, say this is going to be a tough one for Detroit to win away from the Motor City. Here's the thing about Seattle not showing up in random games - it usually happens against really good teams (or at least teams with one spectacular unit). The Rams' defense shut them down. Arizona's defense shut them down. Tampa Bay's pass rush shut them down. The Packers' offense blew them out. None of those things are that embarrassing - those are all good units that have played exceptional games this year. The other thing is - all those games happened on the road. Seattle is 7-1 at home this year, with the only loss coming in Week 16 to Arizona, in a game that could have gone either way. When they play mediocre teams at home, they tend to blow them out. Detroit's resume is pretty mediocre - they came out of the gate looking strong with a lot of luck in close games (they started the year 7-2 in games decided by less than a touchdown), but that luck caught up with them - they lost their last three games and none of them were particularly close. In retrospect, Detroit also had a pretty easy schedule (they managed just one win over a team that finished the year with a winning record, and that was Washington). Seattle certainly isn't the juggernaut that they've been in years past, but they should be able to take care of Detroit without much trouble. Betting on the Seahawks has not been for the faint of heart this year, but I think now that the playoffs have rolled around, we'll see a sharper, more consistent Russell Wilson, and a more zone-based Seattle secondary. If the Seahawks don't turn it over and play their game defensively, it's hard to see the Lions having much of a chance, but beware the Seattle letdown. Here are the things we know: Aaron Rodgers is amazing, Jordy Nelson is amazing, New York's defense is pretty awesome too, and Davante Adams had the breakout year that everybody was expecting from him last year. Here are the things we don't know: Is Randall Cobb still any good? Can Ty Montgomery hang in well enough in blitz pickup to stay on the field? Cobb has had a tough year - he's battled injuries, and even when he's on the field, he had career-low numbers in both catches and yards per game (not including his rookie season in which he was mostly just a kick returner). The Packers will need Cobb to contribute in this game, because the Giants have been especially good in the secondary all year. The Giants surrendered just 15 touchdown passes (2nd best in the league) and just 6.0 yards per pass attempt (7th best). When the Giants have struggled to defend the pass, it's been against teams that can spread the field with reliable receivers and force New York to play one-on-one across the board. The Packers, Redskins, and Steelers have all had success against the Giants this year by flooding the field with receivers. Green Bay will need Cobb (and Jared Cook, and Ty Montgomery) to be assets in the passing game. Montgomery is the wild card. He's effectively just a full-time running back now, but he's deadly in the screen game because he still has the running style of a wide receiver/kick returner. His biggest issue is in pass protection. 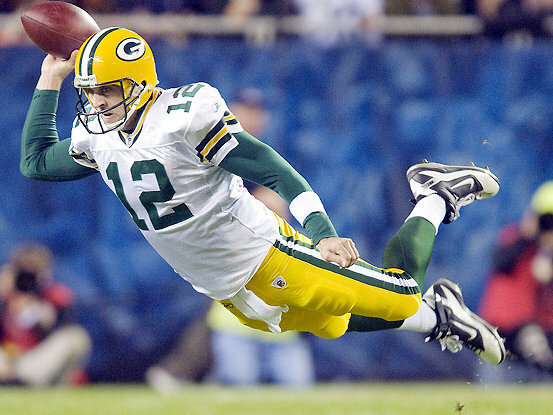 Aaron Rodgers holds the ball in the pocket for as long or longer than any other quarterback in the league. In order for him to pull that off, he'll need his running back to pick up any extra blitzers. The Giants have struggled with their pass rush at times this year, and could try to disrupt Rodgers by sending extra guys to take advantage of Montgomery's foibles in pass protection. If Montgomery can pick up those blitzers, or having Randall Cobb in the lineup helps Rodgers to get rid of the ball quicker, the Packers could repeat their performance from earlier this year when they beat the Giants wire-to-wire. If you watched Week 17's Sunday Night game, you might recall that Cris Collinsworth highlighted how bad Green Bay has been at defending the right side of the field, particularly deep. Football Outsiders and Pro Football Focus have done a great job in recent years in breaking down the minutia of where each defenses' weak spot is, and we've certainly found Green Bay's. When offenses throw the ball deep down the field to the offenses right side against Green Bay, their passer rating is roughly 400 on a scale that only even runs to 158.3. They've been hopeless. Football Outsiders measures them to be 102.6% worse than league average on passes 16 or more yards downfield on the right side. A lot of this has to do with Green Bay's revolving door in the secondary. They've been absolutely decimated by injuries. Sam Shields and Demetri Goodson have been on IR for months. Quinten Rollins is doubtful to play this week with a concussion. Damarious Randall is nursing a knee injury but is likely to play. The Packers will be turning to Ladarius Gunter, and safety Micah Hyde will probably also get some run at cornerback this week. How well the Packers adjust to what seems like a no-brainer opportunity for the Giants will go a long way in determining the outcome on Sunday afternoon. It also opens up a possibility that the Packers rotating coverage to that side opens up holes elsewhere. One way or the other, the Packers have a lot of work to do to shore up their secondary. If they can't, they might find themselves on the wrong side of a Giants upset at Lambeau once again. It wasn't so long ago that Green Bay was riding a four-game losing streak, and left for dead at 4-6. Since then, the Packer have rattled off six straight victories, thanks largely to quarterback Aaron Rodgers, who has been in peak form the last month and a half. Going back to Green Bay's last loss against Washington, Rodgers has thrown for 18 touchdowns and zero interceptions, while averaging nearly 290 yards passing per game. In total, Rodgers led the league with 40 passing touchdowns, and threw a minuscule 7 picks as top receiver Jordy Nelson led the league in touchdown catches, Davante Adams enjoyed a long-awaited breakout year, Randall Cobb played well when healthy, and tight end Jared Cook excelled as he got healthy late in the year. One cause for concern offensively is the ground game, which ranks 20th in the league and has seen three different backs placed on injured reserve this year, including star Eddie Lacy, and seen reliable back James Starks enter the league's concussion protocol after a car accident. In fact, converted receiver Ty Montgomery actually led the Packers in rushing this year with 457 yards (Rodgers was second with 369), and most of that came in a 162 yard explosion against the Bears three weeks ago. Last week, the Packers relied on second-year fullback Aaron Ripkowski (a man who rushed for only 13 yards in four years at Oklahoma) as their top back, so things are getting a little desperate. Defensively, Green Bay is expecting to have the services of star linebacker Clay Matthews, which is good news for a D that ranks 31st against the pass. Like most teams playing on Wild Card weekend, 2016 has been a mixed bag for the Giants. The G-Men have improved tremendously on defense, jumping from in 30th in scoring defense last year to to 2nd this season, but rank near the bottom of the league in scoring offense (26th) and total offense (25th). To put into context just how good New York has been, particularly against the pass, this year on defense, the Giants have allowed only 15 passing scores (2nd best in football), while grabbing 17 interceptions (4th best in football). They've done so by playing a ton of man-to-man with corners Dominique Rodgers-Cromartie, Janoris Jenkins and Eli Apple, which allows coordinator Steve Spagnuolo to bring a ton of blitz pressure, and play safety Landon Collins as both a centerfielder, and in the box. Both of those moves have paid off, as Collins has emerged as one of the league's most versatile safeties, and the Giants have seen 13 different defenders come up with a sack. Offensively, it's the same story as usual: As Eli Manning goes, so go the Giants. Manning has been his usual good-not-great, and occasionally head scratchingly terrible/somehow phenomenal at times self this season. It's pretty much impossible to predict which Eli will show up on a given day, which is bad news for an offense that ranks 30th in the league in yards per rush attempt (3.5). Basically, if good Eli shows up, the Giants will be able to move the ball through the air with Odell Beckham, but if bad Eli shows up, it could be a long day for the New York offense, and the Giants defense will have to bail them out. When you get right down to it, I trust Aaron Rodgers more than I trust Eli Manning, and as good as Odell Beckham is, I trust Green Bay's receivers more than I trust New York's. Green Bay's offensive line has been probably the best pass blocking outfit in the league this year, and that could spell trouble for a Giants pass rush that has disappeared at times. If the Giants can't get pressure on Rodgers, eventually, he's going to find an open receiver. The Packers' offense has returned to form with Jared Cook back in the lineup. It may or may not be a coincidence that the Packers are 8-2 when Cook plays and 2-4 when he doesn't, or that Aaron Rodgers had a passer rating of 92.3 during the stretch when Cook was out of the lineup, but has posted a passer rating of 120.0 since, but I'm leaning towards it not being one. A healthy Jordy Nelson and Davante Adams give the Packers two elite receivers on the outside. A healthy Randall Cobb and Jared Cook give the Packers two elite receivers in the middle. As good as New York's defense has been, I'm not sure how they can contend with that unless their defensive line plays the best game it has played all season. A Giants win would probably require some success in the running game - keep Green Bay's offense off the field, sustain long drives, and score touchdowns in the red zone. Unfortunately, that just isn't the Giants this year. New York ranks 30th in time of possession, 28th in plays per drive, and 27th in yards per drive. They're an offense that relies on Odell Beckham to make big plays. He very well might, especially considering Green Bay's struggles mentioned above, but my money is on Green Bay's depth being able to outscore a singular performer. Each of these teams has won (a) championship(s) as the "hot team" heading into the playoffs, and the Packers certainly seem to fit that bill better this year. Rodgers has been outstanding the last month of the season, and Jordy Nelson in the midst of bounce-back year, but it's all the other weapons that made Green Bay so dangerous. The Giants have improved defensively, mostly in the secondary, but I don't think it will be enough to stop Rodgers the way he's playing. On the other side, New York's strength (passing) does line up with Green Bay's weakness, but as Jeremy said, if this devolves into a shootout, it's hard not to take Rodgers.